Complete your dream kitchen with a stylish AEG oven. Our extensive range of AEG ovens spans a variety of sizes, levels of functionality and price points, but whichever model best suits your kitchen and budget you can be sure it will look the part. All AEG ovens are finished to an exacting standard and exude the sort of sleek, understated quality you'd expect from a leading German manufacturer. First-class build quality is matched by innovative design and a high level of functionality that will enhance your everyday kitchen experience. 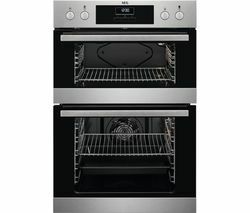 Take the SteamBake BPS352020M Electric Steam Oven, a multifunction oven that allows you to cook with the benefits of a range of functions, including fan assisted, grilling and more besides. It also features PlusSteam, which adds steam at the beginning of the baking process. This keeps dough moist on the surface to create a golden colour and tasty crust, while the heart stays soft and tender. The AEG Food Sensor is another brilliant feature that will genuinely enhance your cooking. Allowing you to measure the core temperature from the centre of your dish during the cooking process, the Food Sensor will help you achieve perfect results every time. Even better, this ingenious AEG oven is self-cleaning! With one touch of the Pyrolytic cleaning function, dirt, grease and food residue in the oven is converted into ash that you can easily wipe off with a damp cloth. If you've ever had to clean an oven the old-fashioned way it's a feature you're bound to appreciate. 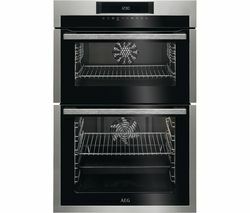 Our AEG range includes an extensive choice of single and double ovens, as well as warming drawers. Explore our complete oven collection to browse a wide range of single and built in double ovens, including the latest Bosch, Belling, Hotpoint and Smeg ovens.